Dan Milstein, CEO of Gold Star Mortgage Financial Group in Ann Arbor, Michigan, and author of The ABC of Sales will appear on ‘The Balancing Act’ on Lifetime Network on Wednesday, February 29th at 7-8am et/pt. This inspiring book not only tells an exciting tale of success and achievement, it also gives you the tools and strategies you need to achieve all your goals. Super Salesman and acclaimed author Dan Milstein will be sharing some of his secrets on how to achieve greatness in sales to a national audience Wednesday morning with a personal appearance on the Lifetime Network. Milstein, CEO of Gold Star Mortgage Financial Group in Ann Arbor, Michigan, will appear on ‘The Balancing Act’ on Lifetime Network on Wednesday, February 29th at 7-8am et/pt. In addition to being a nationally-recognized executive and sales leader, Milstein is author of The ABC of Sales (ISBN 978-0-9835527-0-3), Gold Star Publishing, 2011, $19.95, 196 pages, Kindle and Audio Book, http://www.ABCofSales.com ). In his book Milstein gives readers advice on how to become a super salesman, revive their sales careers, or how to position their companies among the elite. The Balancing Act is a premier one-hour women’s morning show that showcases guests to illuminate new ways for women to achieve success in all areas of their lives. The show, dedicated to creating trusted solutions for women facing today’s greatest challenges, is hosted by Beth Troutman, Kristy Villa, and Danielle Knox. During one hour each weekday morning, the hosts focus on trends and tips plus advice from the country’s leading experts. Gold Star Mortgage Financial Group (http://www.goldstarfinancial.com) a full service mortgage financial service based in Ann Arbor, MI. Gold Star is committed to providing the highest level of personal financial services in a professional manner. Its primary fiduciary goal is to build and develop relationships with its clients that are professional and last a lifetime. Established in 2000, Gold Star now employs over 500 people within 35 offices throughout the United States. The company is currently ranked as the 53rd largest residential lender in the country. Under Milstein’s leadership, the Greater Detroit area company has become the 14th fastest-growing financial services company by producing revenues that were up 712% from 2005 to 2008. Dan Milstein’s new book, The ABC of Sales, was recently named the first place winner in the General Non-Fiction category of the DIY Book Festival, Los Angeles. Author Daniel Milstein also earned an honorable mention this year for The ABC of Sales in the prestigious New England Book Fair. Born in Kiev, Ukraine, Daniel and his family relocated to the United States after the Chernobyl nuclear disaster. He received his education with honors in business management and finance and graduated with a BBA from Cleary University, Ann Arbor. Milstein worked his way up from assistant consumer lending manager, to general manager, to underwriter, to Chief Operating Officer and finally Chief Executive Officer within the various financial institutions. Daniel Milstein is CEO of Gold Star Mortgage Financial Group, an Inc. 500 company, and is author of The ABC of Sales, http://www.abcofsales.com. Milstein has been recognized as the #1 mortgage originator in the nation, has been among the top 40 finance professionals in America for 10 years, and has been named the top employer in Michigan for three years by the Detroit Free Press. Milstein has achieved more than $3 billion in personal career mortgage sales, is a licensed mortgage lender in 20 states, and has 15 years in the banking industry as an executive, originator, underwriter, productions and operations manager with the highest track record in the industry. 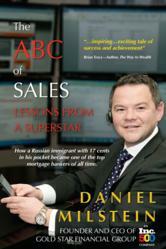 Media Contact: For a review copy of The ABC of Sales or to arrange an interview with Daniel Milstein contact Scott Lorenz of Westwind Communications Book Marketing at scottlorenz(at)westwindcos(dot)com or http://www.book-marketing-expert.com.